Observation - Ruby Tiger Caterpillar - UK and Ireland. 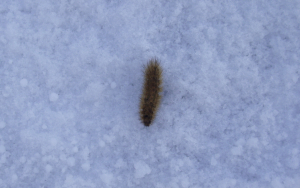 Description: This caterpillar was sitting in the middle of a snow covered path. It is about 30mm long, reddish with swirls of long yellow hairs. This caterpillar was sitting in the middle of a snow covered path. It is about 30mm long, reddish with swirls of long yellow hairs.